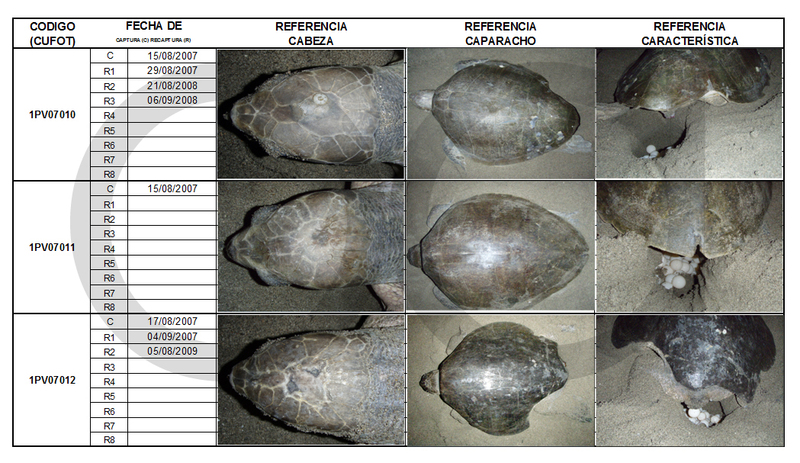 Photo-Identification of Lepidochelys olivacea as a reliable method for monitoring nesting beaches. A method of photo-identification is presented as a viable and economic alternative for monitoring Lepidochelys olivacea on nesting beaches. This method was applied since 2002 on a solitary nesting beach in Puerto Vallarta, Jalisco, Mexico, and was designed based on the visible physical characteristics of each individual (i.e. malformations, scars, fractures, etc. ), as well as the carapace scutes and head scale patterns. Individual turtles are assigned into one of five categories, with a unique code that includes: category, location, year of capture, individual number, and in case of recapture, an additional code with the year of each recapture. Through visual comparison between the individuals photographed information such as population size, site fidelity, remigration intervals, seasonal nesting frequency, health conditions (fibropapilloma, tumors, malformations, etc.) and anthropogenic aspects such as frequency of individuals with evidence of entanglements in fishing gear and collisions with boats can be obtained. Each individual is recorded in a database according to their category with its individual code, date of capture and recaptures, and 3 photos as visual reference (head, shell and any unusual feature), which facilitate the recognition of individuals previously catalogued. Examples are given of the fieldwork and categorizing methods, as well as an analysis of the pros and cons of it compared to other commonly used identification methods. In a general context, this is a very effective and simple method of identification that can be easily applied and does not require specialist training of staff and volunteers.